The first seventeen years of my life were spent in a dilapidated, bar-on-every-corner, mill town in Western Pennsylvania. Insulated. That’s the best word to describe the childhood I spent in a single stop light town of fewer than five thousand people. We didn’t get out much. There was the almost annual birthday trip to the now defunct Sea World in Ohio that only took place if mom was in the right kind of mood to make the two hour journey. I remember exactly two vacations both of which were to Niagara Falls, Canada. The town’s smallness and the fact that everyone knew everyone else didn’t comfort me in the way that it did some. It was suffocating. There were no secrets. When officer Divens showed up at your house to investigate a “domestic disturbance” reported by the neighbor that complained every time your ball went in her yard, you could bet the news had spread from the corner store on the east side to the sub shop on the west side by breakfast the following day. City living, the likes of which I only gleaned from watching too much TV, represented all the glamour and vibrancy I’d never known but craved. On long walks delivering newspapers I’d fantasize about riding alongside Ponch as a California Highway Patrol officer, hair blowing from underneath my helmet, mirrored glasses that screamed the kind of cool I was desperate to be, and the tall buildings whizzing by in my wake. Or maybe I’d join Cagney and Lacey on a gritty crime scene investigation in the heart of Manhattan. Their kind of who-done-its were a lot more interesting than investigating who threw the beer bottle at whom. Someday. Eventually, I made my way to a big city—Chicago—where I’ve remained for over a decade and a half. My first years as an urban dweller were everything I’d longed for so long ago on my paper route, the towering buildings, the energetic pace, the diversity, and maybe best of all, the anonymity. There was something strangely comforting about losing myself in a bustling sea of nameless faces every morning on my way to work. Through the sharp lens of hindsight, I now understand that losing myself is exactly what I was hoping to do when I moved to the city. Lots of growing up and a decade later I started craving a life in a different kind of big place. I wanted wide open spaces, a rolling landscape, and a meaningful connection to the earth. In 2010, I left Chicago and Greg behind for an opportunity to experience a rural existence. I spent six weeks working as a cheese making apprentice and awkward farmhand at Longview Farm in Washington County, New York. Greg was sure I couldn’t handle being away from the city, but there, living in the midst of strangers—strangers that would become dear friends—I’d never felt more at home. At Longview, then, and every time I’ve visited since, there is an immediate sense of belonging. Labels are irrelevant. I’m not defined or judged by my ability to have children, my relationships, or my career choices. There is an urgent rhythm to life on a dairy farm that cannot be controlled or denied. Animals must be cared for, and milk is impatiently waiting to become cheese. Everything else is secondary. Tending to these incessant demands is hard work as our bleary eyed farmer friends Liza and Dave can attest, but there is an intrinsic simplicity that is intoxicating for me and Greg too. You don’t have to search for a quiet place to meditate there. You just put on your muddy boots and walk among the clucking hens. Or hike through the woods to the cadence of snow crunching under foot. Or slip on your running shoes instead and head west until the gravel road ends. I return to Longview Farm with Greg in tow as often as our schedules allow, which is never enough. Reconnecting with Liza and Dave, their land, and their entourage of goats and fowl is like pushing a reset button on our lives. This year marked our first ever spring visit and our first visit during kidding season. Goats are curious animals and baby goats all the more so, probably because nearly everything is new to them and their data on the evil in the world is limited. That unconditional trust is refreshing and shockingly unfamiliar. My hot pink and yellow rain boots with their big buckles and my purple coat of many zippers made me the equivalent of a 5’-3” goat toy, and I couldn’t have been happier about it. 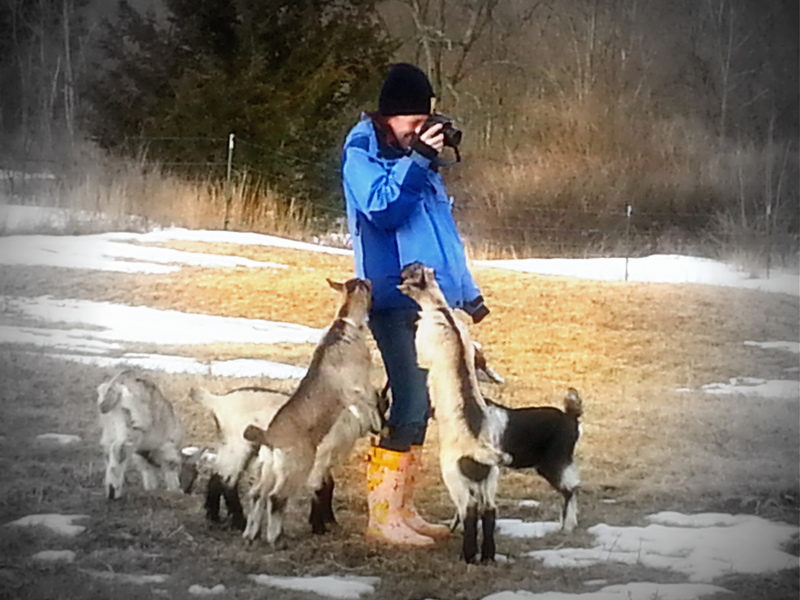 The little goats, a black one here, an oatmeal one there, would jump on their hind legs and chew on the zipper pulls of my jacket, as their front legs left muddy hoof prints up and down my jeans. Later that night by the fire, my cheeks throbbed—from smiling. Happiness at Longview is a baby goat nuzzling my calf; an unadorned, tender, juicy chicken raised just a few yards from where it was roasted; and evenings by the fire with our friends, Greg to my right with a warm cat nestled in his lap. We trade stories and even share viewpoints on controversial subjects without offense. And sometimes we just sit in a comfortable silence that’s punctuated with the occasional snap of a burning log. Will this life be ours one day? With each visit, we return home recharged and eager for a farm to call our own. In the meantime, I vow to find that same peace in my life, the life I’m currently committed to for the other 360 days of the year, but it’s a struggle. The earthy smell of the fermenting hay and the undulating vistas that made those long country runs feel too short, are replaced with stoplights and impatient drivers. We find happiness in Chicago too; it just requires more effort. Peace and quiet is harder to come by here. Spending casual time with friends and family must be scheduled weeks, even months in advance. Sitters must be hired. And if we’re going out for dinner, a reservation is often required. We returned from our most recent visit to Longview farm two weeks ago. Not a day has passed that I haven’t thought about the simple joy those little goats brought me. I considered the contrast of life at Longview and life in Chicago as I meticulously cut out these cookies. They’re an uncomplicated shortbread that on the farm I would have simply scored with a dull paring knife and sprinkled lightly and quickly with salt. While they baked I’d have had just enough time to gather eggs from the barn. 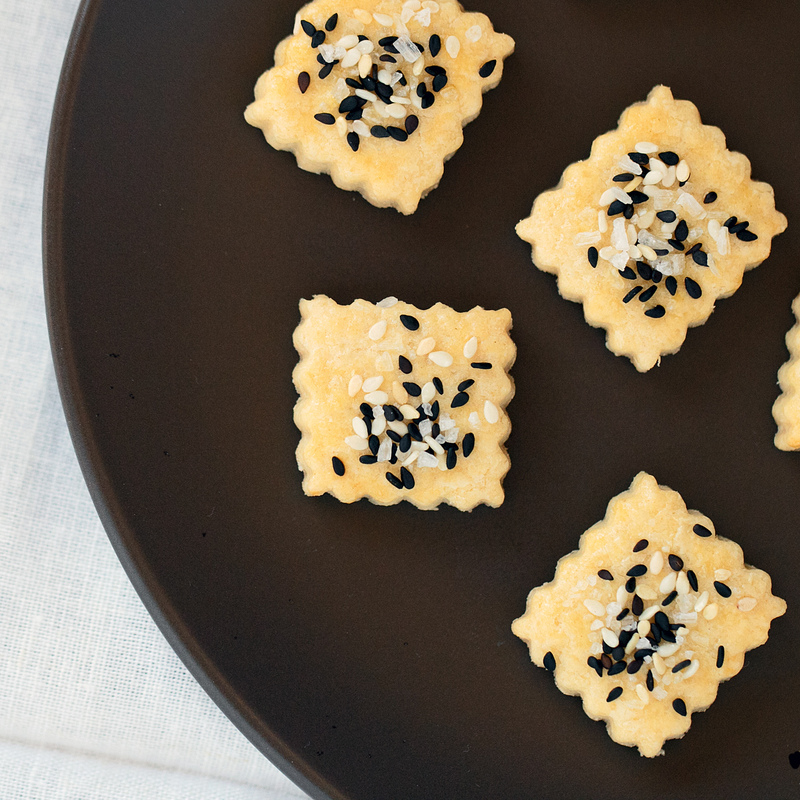 But in Chicago, I’m called to explore what’s possible with these simple cookies, to dress them up a bit, and to make them the darling of the savory cocktail cookie assortment I was preparing for a client’s party. I started with a dusting of sea salt. Then I added pale blonde sesame seeds, imagining their satisfying crunch in contrast to the tender, crumbly cookie. Maybe my life doesn’t have to be either or at this point, I thought. I can divide my time between wide open spaces while still finding joy in this pulsating city now perched on the edge of spring. And with that I added the black sesame seeds to my now decidedly fancy shortbread and put them in the oven. Adapted from Mary Cech’s Savory Baking. In a medium mixing bowl, whisk together the flour and salt. Using a pastry cutter or two knives, cut in the butter until coarse crumbs form. In a separate bowl, whisk together the egg, egg yolks, and water. Reserve one tablespoon of the egg mixture for brushing. Make a well in the center of the flour and add the egg yolk mixture. Bring the dough together with your hands. Press it into a 1-inch thick disc and wrap it in plastic wrap. Refrigerate until firm, about 45 minutes. In a small bowl, combine the coarse sea salt and sesame seeds. Roll the dough out to 1/4-inch thickness. Cut into any shapes you desire. Place the cookies on the prepared baking sheet about 1/2-inch apart. Brush the tops with the reserved egg mixture. Sprinkle with the sea salt and sesame seeds. Bake until lightly golden on the bottoms, about 20 minutes. Transfer to a wire rack to cool. Serve immediately or store in an airtight container. An author I met in Wisconsin signed his book for me with the inscription, “For Melanie, who lives in two places.” It’s the perfect description and challenge for those of us who can appreciate and even thrive in two very different environments. It’s become my mantra, to truly live-fully and joyfully- in two places. I wish the same for you.